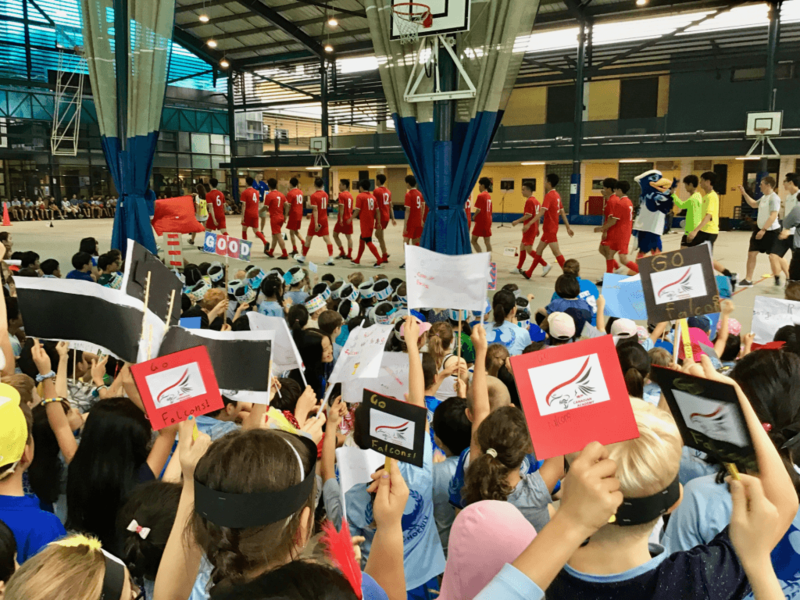 We gathered together on Thursday morning to support our adopted team, the Canadian Falcons from Singapore. We had a lot of fun cheering them on as well as boosting the energy of our UNIS varsity team. Over the next few weeks our D-2 School Counselor, Kris Bezzerides, will begin a series of lessons about Body Safety. One of the main goals for these lessons is to provide our children with knowledge and teach protective behaviors in regards to their bodies and their right to be safe. These lessons are age – appropriate and non-threatening. They are designed to empower students. 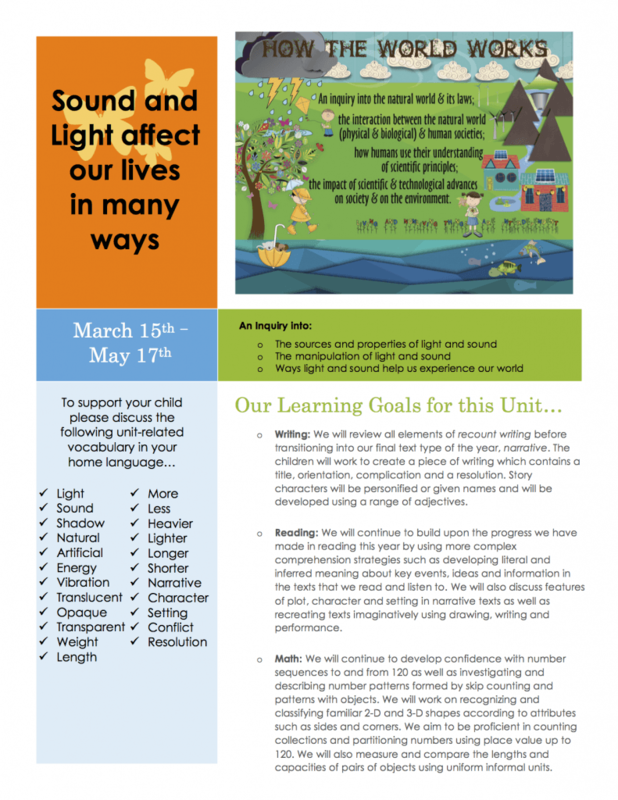 Please see Ms. Bezzerides (kbezzerides@unishanoi.org) if you have any questions about these lessons or how to talk with your children about this topic at home. Save the Date: Student-Led Conferences will take place on Friday, April 19th. (8am-4pm Grade 1 Conference Times Only). Please ensure that you have signed up for an available time slot on Veracross. Due to the Hung King National Holiday there will be no school on Monday, April 15th. For those of you not traveling over the long weekend you are invited to join Ms.Michelle for a Maker Day Extravaganza on Saturday, April 13th from 8:45-11:00am. Calling all Book Donations!!! We are looking for any used books that you may be willing to part with for the upcoming SCO Book Fair. All donations are appreciated (home language books, children’s books, adult books, travel/cook books!). Book week costume reminder: Thursday and Friday the 2nd/3rd of May. Please support in finding (or making!) a costume of a favourite book character along with a copy of the book. 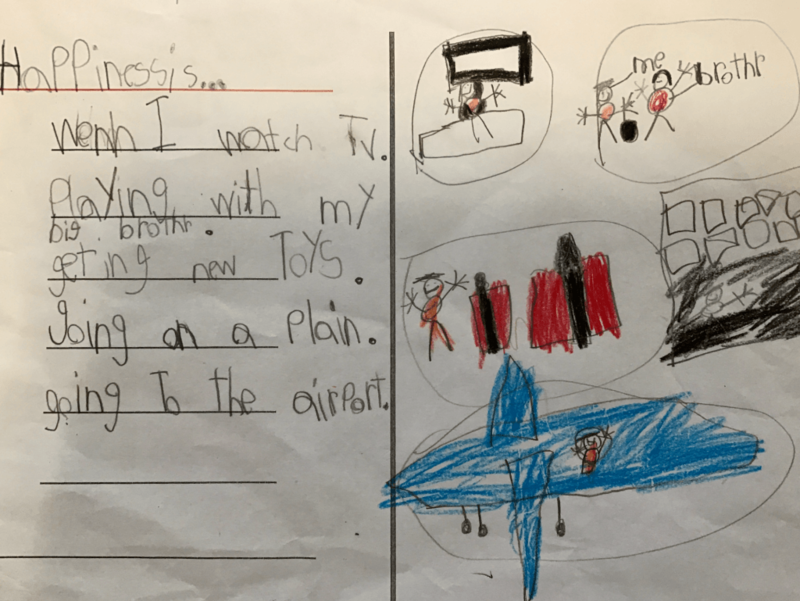 This week in Grade 1C…. 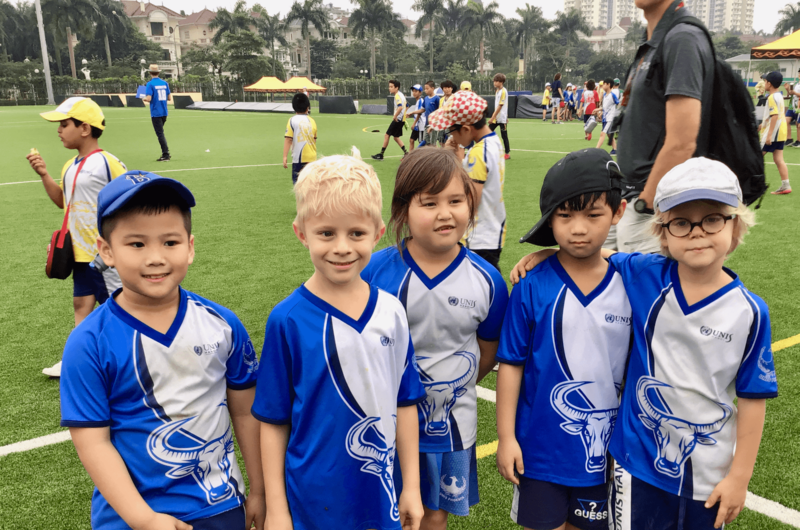 The tigers were crowned this year’s ES champions but the sprits of the lions, buffalos and eagles could not be dampened. 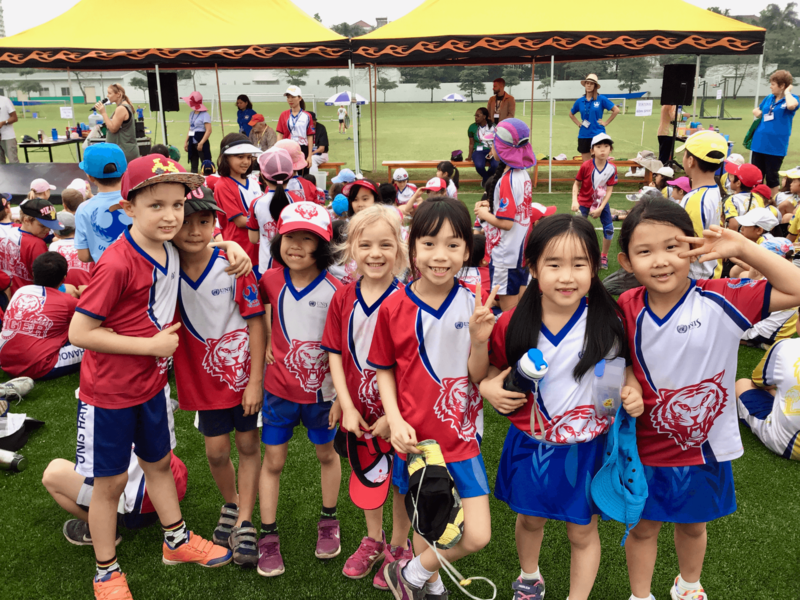 We had a wonderful morning of fun activities organized by our fantastic P.E. department. Thank you to those of you who made it to the large field to cheer us on! This week and last we have had a series of light and sound provocations aimed at generating wonderings about how light and sound are created. We joined Mr.Delegrana’s high school band lesson to find out how some of their extraordinary band instruments create beautiful sound. Thank you to Ms. Penny for sharing this video with us. Spring Break starts today, classes commence on Monday April 8th. Holiday Reading: Please support you child in reading their three chosen readers over the break. Also, please encourage your child to be a word detective by selecting one word from each text that contains a prefix or suffix. Thank you to everyone for attending and supporting all the children in our Grade 1 community during Friday’s Wax Museum. 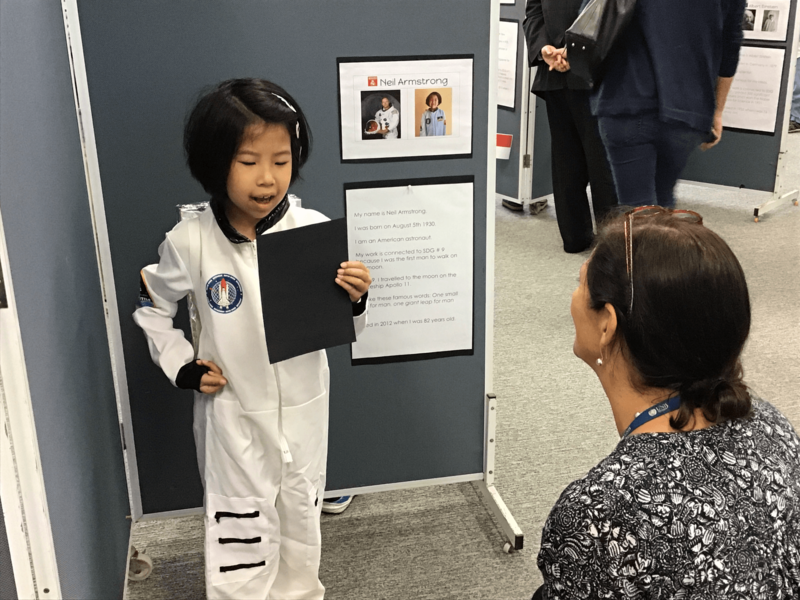 We think you will agree that each child did a tremendous job showcasing their research and communication skills with you all. World Happiness Day and World Poetry Day all in one week! 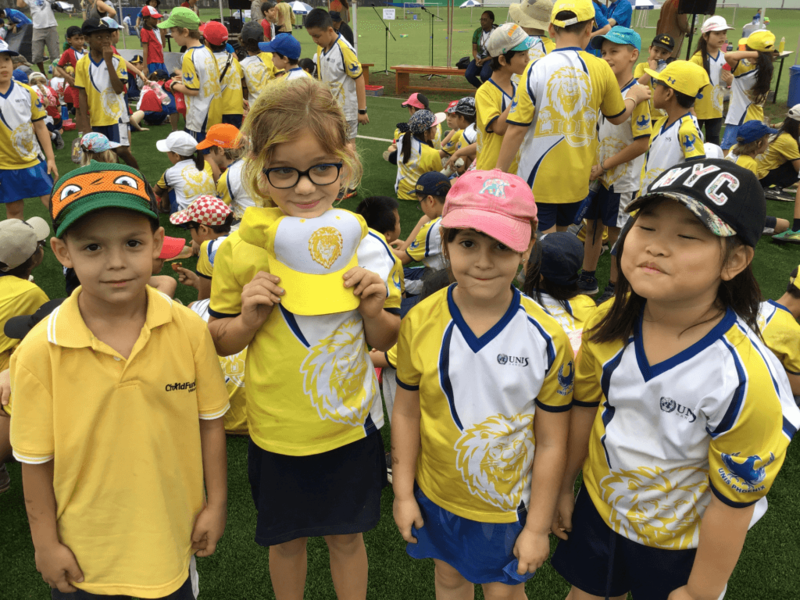 On Wednesday, we celebrated world happiness day and inquired into the meaning of the word happiness. We brainstormed words related in meaning and generated a word family including happy, unhappy and happily! 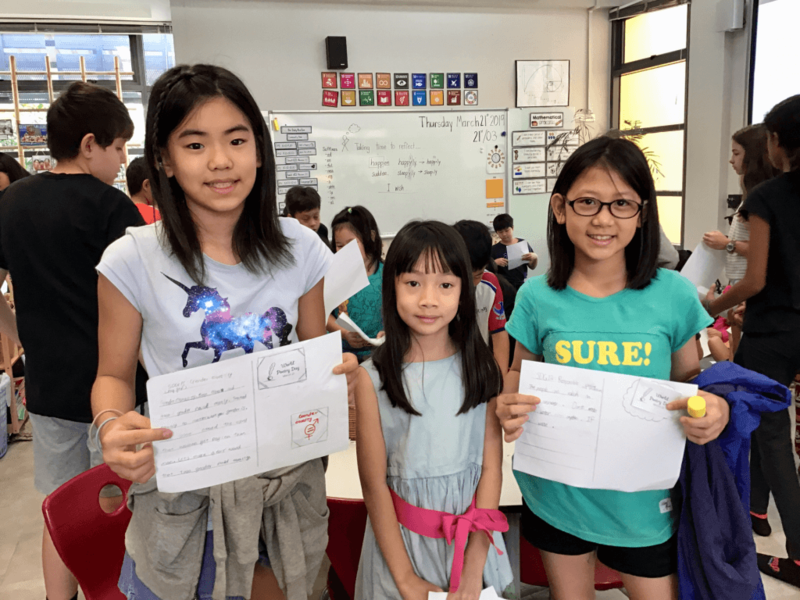 On Thursday, we were joined by our Grade 5 Buddies to celebrate World Poetry Day. 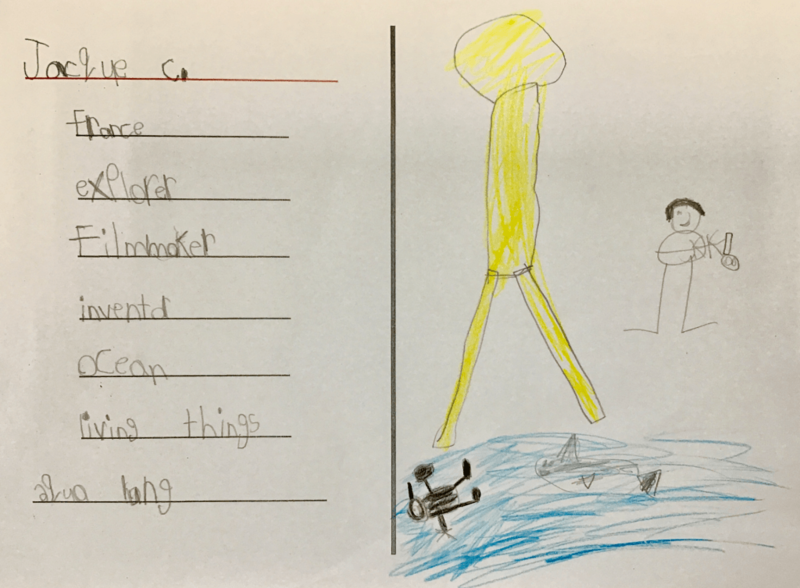 We wrote poems using an I wish… repetitive pattern connected to the Sustainable Development Goals. Swimming starts on Monday (March 25th) and will take place every Monday and Wednesday until the end of the school year. Please ensure your child has suitable swimming attire, a cap and goggles for each lesson. 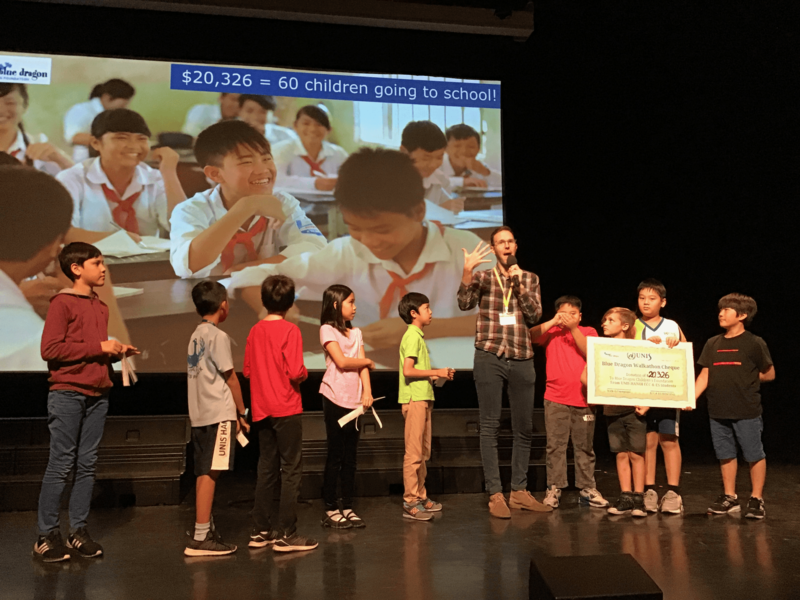 During assembly on Thursday we welcomed back Mr.Tom of Blue Dragon to present him with a cheque for 20,326USD. What an amazing commitment and achievement from our school community. Mr.Tom thanks everyone for their amazing contributions and shared with us that this year’s money will go towards educating 60 children here in Vietnam. Thank you to everyone for your support. This week, as part of our inquiry into significant people we have been looking at the importance of questioning and conducting interviews to find out information. We interviewed each other to find out why each of our chosen people are/were significant and we hope to do the same with other classes next week. 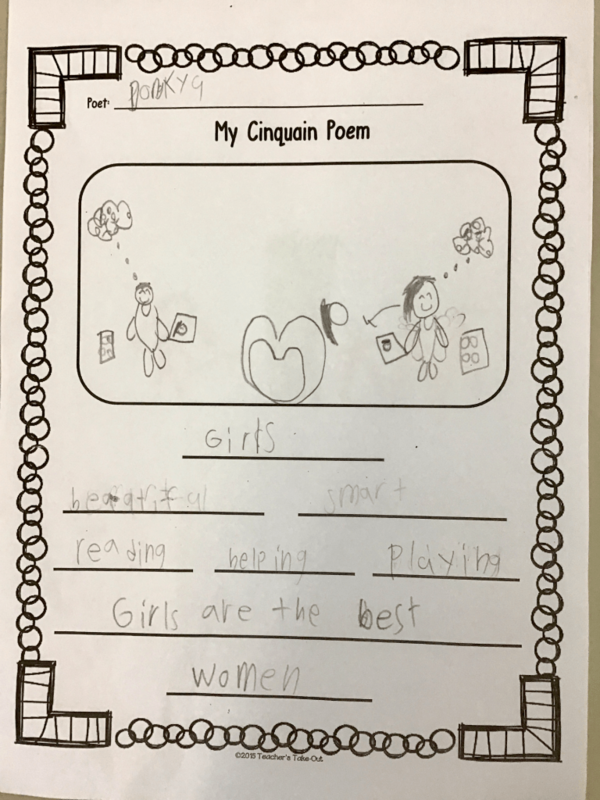 To celebrate Women’s Day, March 8th, we created cinquain poems connected to SDG #5 Gender Equality. Part of our celebration of women is recognizing that women and men, boys and girls should be treated as equals and afforded the same opportunities. No School on Monday, March 11th. Join us for the Spring Fair on Sunday March 17th. 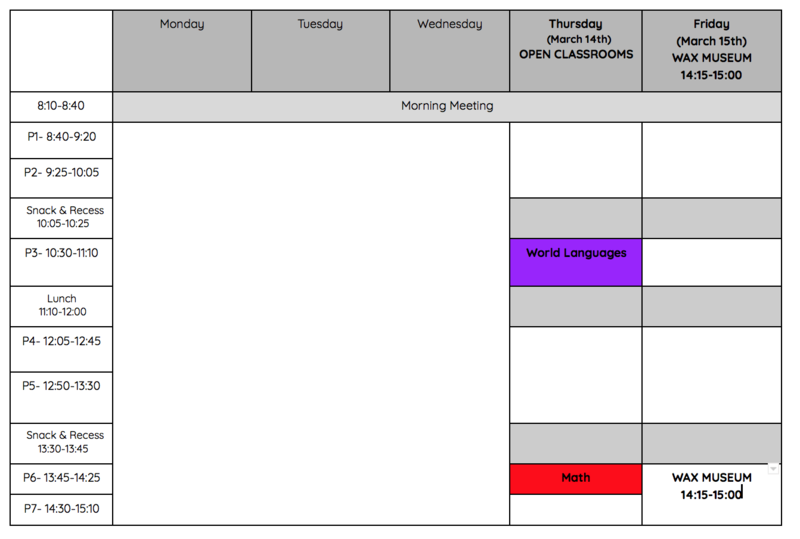 Please see the timetable below for times to visit during open classrooms. 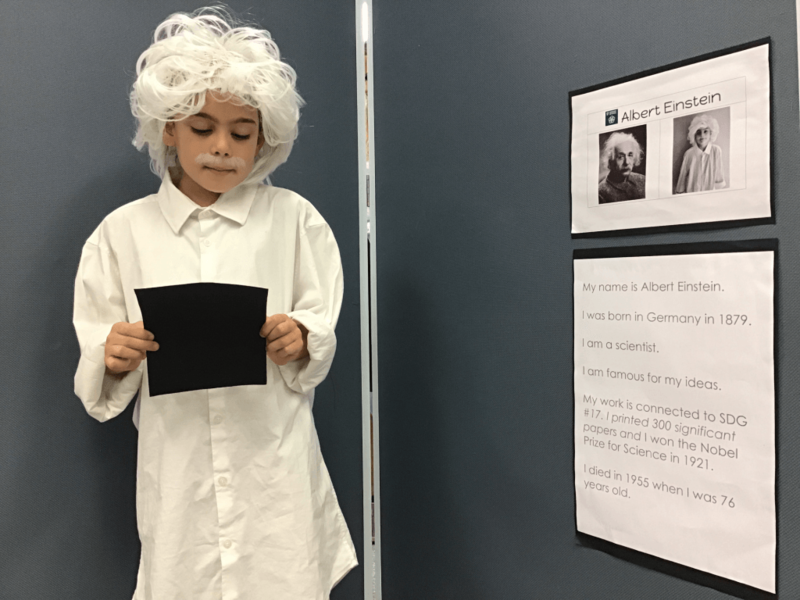 Please note that instead of open classrooms on Friday you are invited to join us for the Grade 1 Wax Museum Exhibition from 14:15-15:00. We have spent a considerable amount of time researching our significant people and learning about the contributions that they have made to the world. This week we focussed on the concept of time and created a timeline of the periods during which our chosen people affected the world. To connect to our unit How We Express Ourselves we also created List Poems using key vocabulary related to our significant people. 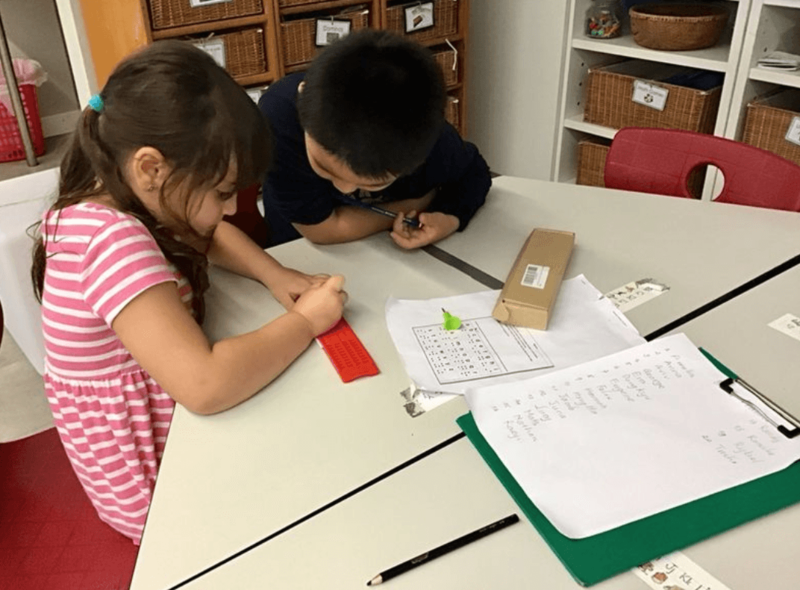 A big thank you goes to Abigail for taking the initiative to teach us how to write our names in braille. Abigail has chosen Helen Keller as her significant person and was inspired by her ability to read using the raised dot system that we know as braille. 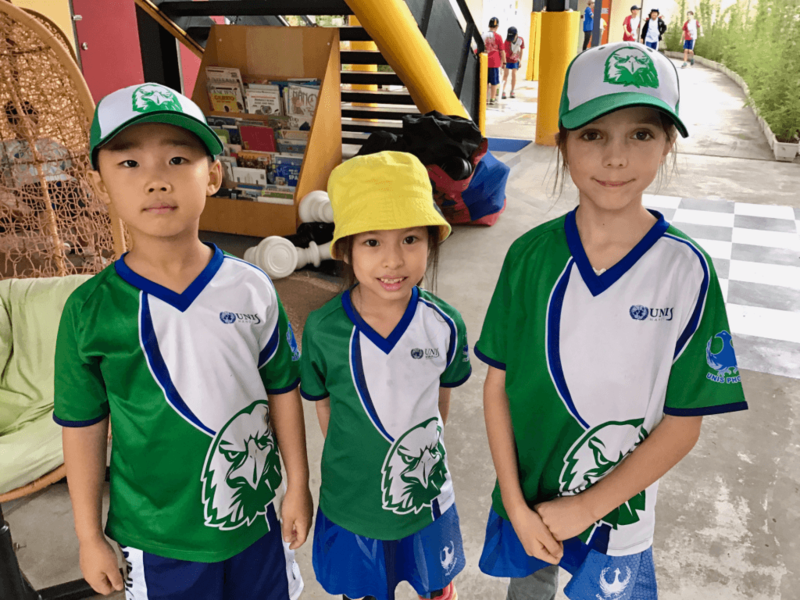 Significant Person Costumes: Please ensure that your child brings in their costume by Monday as we will begin recording green screen performances next week in the run up to the event on March 15th. Open Classrooms will take place on Thursday and Friday (March 14th & 15th). More information will be shared regarding the open classroom schedule on Thursday. Please note that student presentations of their significant person will take the place of open classrooms on Friday March 15th (14:30-15:15). Save the Date: Student-Led Conferences will take place on Friday, April 19th.